Alchemilla mollis, or lady’s mantle, is a herbaceous perennial that forms attractive, pale green clumps of leaves that are shaped like scallop shells. Being densely but finely hairy, these catch droplets of dew and rain, which sit as miniature spheres on the leaves, catching the light and resembling shiny beads of mercury. The dense, frothy sprays of yellowish-green flowers held just above the leaves from late spring until early summer blend with the apple green foliage in terms of colour but add a diversity of texture that gives the plant a subtle charisma. It is a stalwart of herbaceous borders across the UK, and is often used as ground cover or in extensive drifts between perennials with more striking foreground colours to bring a rhythm and continuity to a herbaceous planting. The same characteristics that make the plant such an understated star of the herbaceous border apply equally in the vase, and lady’s mantle is a favourite with flower arrangers for its restrained but attractive foliage and flowers that have an ability to combine and blend the more prominent and disparate cut flowers in the display. The name Alchemilla mollis is said by some to refer to the Arabic for ‘little magical one’, as in the Middle Ages the morning dewdrops collected from its leaves were believed to have healing properties. Herbal medicinal uses persist today, and the plant is known to contain salicylic acid, a derivative of aspirin that has sedative and analgesic properties and which is increasingly popular in acne and skin exfoliation preparations. Other interpretations of the derivation of its name suggest that the dewdrops were considered by ancient alchemists to be the purest form of water. As a result, they were said to use this water in their pursuit of making gold from base metal, and hence the name ‘Alchemilla’. C. mollis is a native of southern Europe, and the big brother of our native wildflower Alchemilla vulgaris, known as the common lady’s mantle, which is widespread throughout Britain and mainland Europe, especially in undisturbed chalky grassland habitats. The article explores the care of lady’s mantle, a very easy plant to grow and one that brings rewards far in excess of the effort required. The wider Alchemilla genus comprises more than 20 species of lady’s mantle, but only a few are widely available for the garden. This article focuses on Alchemilla mollis, which has the RHS Award of Garden Merit, but other useful types are available from more specialist nurseries. These include the smaller Alchemilla alpinus, which has silvery-edged leaves and is better suited to alpine beds and rockeries, and Alchemilla erythropoda, a red-tinged species that is more compact and less invasive than A. mollis and is therefore better suited to smaller gardens. It also has the RHS Award of Garden Merit. Alchemilla conjuncta is also of shorter stature, and has a distinctive silvery underside to its leaves. The lady’s mantle plants that are widely available from garden centres are normally the species, but a few cultivars are offered by specialist nurseries. A larger and more robust variety that reaches 60cm tall and can spread to 60cm. The flower stems are generally sturdier and longer lasting, making them even more suitable than the species for cut-flower displays. ‘Senior’ is also larger than the species, carries larger flower heads and has a greyer-green foliage colour. This is the most widely available variety, and it is quite often used in large-scale commercial landscape plantings. ‘Thriller’ has a more upright form than the species, with more robust and larger leaves and a clump-forming habit. It establishes and spreads quickly and can soon cover the ground and inhibit weed growth when planted across an area at 45cm centres. When in full bloom in the sunshine, the flowers give off a very delicate honey fragrance. Lady’s mantle is not a fussy plant, and it tolerates a range of soil conditions including relatively heavy clay. Once established, it is fairly drought tolerant, and it will grow in exposed or sheltered conditions, in full sun or semi shade, and in any aspect. It does best and keeps its attractive colour and form for longer in a sheltered, free-drained spot in a sunny border. Newly planted lady’s mantle plants should be watered regularly until the roots have settled and are growing well. A light feed with a general purpose, potash-based fertiliser will help this process. Once established, lady’s mantle is generally happy looking after itself. Once the flowers start to go over, the plant will produce a lot of fertile seed, so they can be deadheaded if the gardener wishes to avoid masses of invasive seedlings. Any older leaves that start to turn brown can also be removed. To maintain maximum vigour, overcrowded clumps of lady’s mantle can be lifted and divided in spring or autumn. Cut the root-ball with a sterilised knife, and replant the sections into soil refreshed with garden compost or another suitable organic material. Keep watered until established. If the plants are grown in a mulched herbaceous border, mulch around the plant, but keep it well clear of the stems to avoid encouraging rot. Alchemilla does well in any aspect and in positions that provide full sun or semi-shade. While it may not be so vigorous or flower so freely, it will tolerate awkward shady spots. 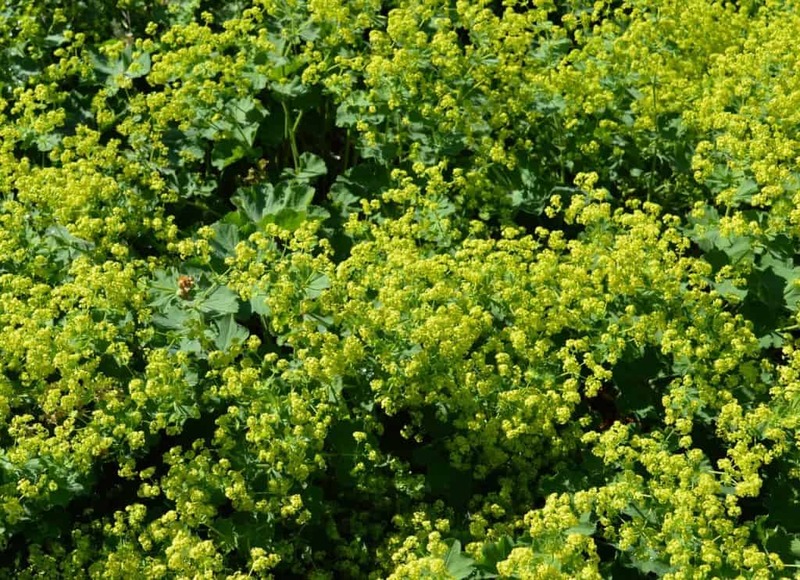 Lady’s mantle is fairly drought tolerant once established, though in the hottest of early to mid summers the leaves and flowers may brown when left in the full sun without water for extended periods. It is worth investing some effort into watering at such times to maintain the vigour and appearance of the plant. The use of a fine spray will also help to create masses of shiny drops on the leaves, which may be a welcome reminder of early morning dew in the spring. The plant is not at all fussy about soil, and it will tolerate most conditions, from heavy clays to free-draining sands, though it will not grow in permanently boggy conditions. A moist but well-drained loam is the ideal. While it generally does best in a neutral to slightly acidic soil between a pH of 6.0 and 7.0, it will grow quite happily right across the typical garden soil pH range. Once established, a lady’s mantle will not require feeding. Lady’s mantle has its own charm and unpretentious beauty and it can be eye-catching in mass planting during the flowering season, but one of the principal reasons for using lady’s mantle in the garden is to bring together other plants in planting design – it acts as a foil and a binding agent that sticks a herbaceous border together, without causing any distraction from the more prominent plants. The lime green foliage is particularly effective when used around purples and blues, such as the flowers of Alliums, cat mint, Ajuga, Stachys and Russian sage, or the foliage of Heuchera, Salvia officinalis ‘Purpurea’, and the black mondo grass, Ophiopogon planiscapus, focussing attention and bringing out the full colours of the companion plants. It has the additional advantage of forming a dense ground cover around the base of plants like Alliums whose interest is at the top of the plant and which might look less attractive when the rather messier lower part of the plant is exposed. It can also be used as ground cover in rose beds and open shrub borders, and the foliage provides a particularly effective background foil to the darker foliage of plants such as Cotinus ‘Royal Purple’, Japanese maples, Hebe ‘Mrs Winder’ and the dark-foliaged elders such as Sambucus nigra ‘Black Beauty’. It also forms an attractive contrast when planted in front of a copper or purple beech hedge. Such is its versatility that it looks equally at home in a dry gravel garden with euphorbia, sea kale and sea holly, or as part of a wilder meadow planting with grasses, daisies, sunflowers and Rudbeckia. Lady’s Mantle also looks great along the edge of a garden or pathway, where it can lean over and soften hard edges and where the dewdrop effect can be enjoyed at close quarters and to its best advantage. It self-seeds quite freely into gravel and the cracks between paving slabs, and plants can be allowed to develop to create an informal appearance, but are quite easily removed when they outgrow the space. In a sheltered position, the foliage will remain attractive for most of the year but if the plants start to look a little ragged in a more exposed position or after a dry spell, they can be cut back to the ground. Depending on the time of year, fresh new foliage will emerge soon afterwards, or in the following early spring. If the foliage looks tired and is starting to brown in July before the flowers are over, it may be useful to lift and divide the plant, or to give it a little supplementary feed. Some gardeners routinely cut back the fading flower heads and foliage in early August to stop self-seeding around the plant, and in good conditions and a mild autumn, the plant may produce a second flush of flowers. Preventing a gradual build-up of dead and dying leaves around the plant in this way may also help to eliminate hiding places for pests, especially slugs and snails. Once lady’s mantle is established in a garden it is seldom necessary to take any special measures to produce new plants. It seeds very freely, and young plants will soon spring up in beds around a parent plant, and these can be very easily lifted and relocated elsewhere in the garden. If more controlled propagation is desired, then the plants can be raised from collected or bought seed or by division. The seed should be spring sown into a seed bed in the garden or into seed compost in pots kept in a cold frame or cool greenhouse. Barely cover the seeds and keep them well watered until they germinate and establish a strong root system. Germination typically takes around three weeks in a pot, and a little longer in cooler soil outdoors. Once large enough to handle without damage, pot-grown seedlings can be set out at the same depth in the border as in the pot, and seedlings from seed beds can be lifted and transplanted to their flowering positions. Some keen flower arrangers sow a row or two into cut flower beds each year to provide a supply of foliage and flowers without denuding the flower borders. Lady’s mantle also divides easily, and this is best undertaken in the spring or autumn. For best results, the entire clump should be lifted carefully, the soil gently washed from the roots and use a sterilised knife to divide the clump into portions. Each needs to have some stems and roots, and pieces about 10cm in diameter from the edge of the clump seem to do best. Alternatively, it is also possible to divide the clump in the ground by cutting straight down with a sharp spade, leaving part of the parent plant in place and lifting the outer sections for replanting. This is a less precise approach, but it is a tough plant and it will generally survive the process. Do not allow the roots to dry out, and replant it into its new position as soon as possible, keeping them watered until established. Alchemilla is generally pest and disease free. Lady’s mantle is a tough plant and it is seldom troubled by pests of any sort. It is even rabbit resistant, another reason for its popularity in country gardens and commercial landscape-scale plantings. Long-term high humidity can lead to minor fungus problems, particularly if the crown is kept damp under mulch. Normal garden hygiene, good air circulation around the plants and keeping the soil immediately around the crown free of mulch and slightly dry will help to avoid or treat any such problems. Q I have a wildlife garden with a good range of flowers but I would like it to appear more formal and less chaotic. A friend has suggested using lady’s mantle as a framework to provide a theme and continuity across the border, but is it any good for wildlife? It needs to do both to earn its place! The subtly beautiful, bright yellow-green flowers of lady’s mantle produce nectar that is easily available to many insects, including bees and butterflies. It is produced at a peak time of year for their demand. Bees may also drink from the droplets of water trapped on the leaves. So, while lady’s mantle may seldom be clothed in butterflies like the later flowering buddleias and sedums, it is nevertheless deserving of a place in a wildlife garden. Q I have a trough on the edge of my patio with spring bulbs and a few other plants that give it interest throughout the year. I like the idea of growing lady’s mantle in it as a contrast to the bright colours, but I think they would be too big and invasive. Do you agree? 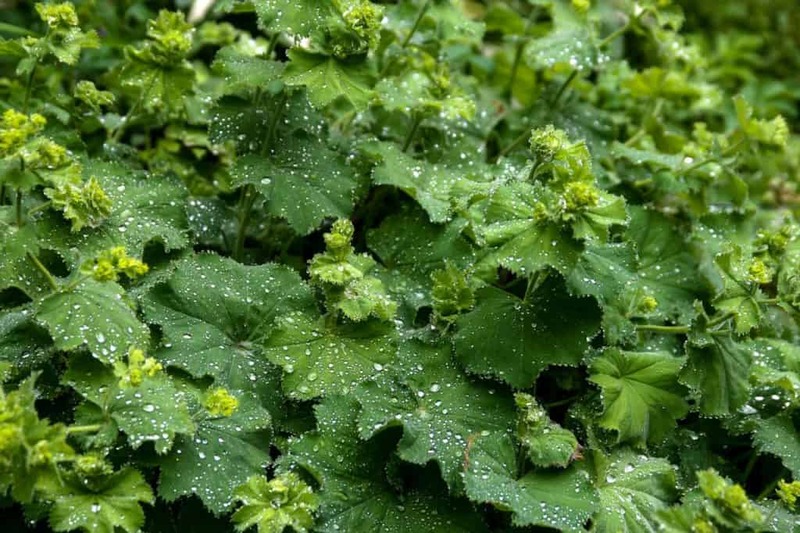 Alchemilla mollis is probably too robust and promiscuous for the trough you describe, but that does not mean that you cannot have a lady’s mantle. Try Alchemilla erythropoda, a miniature facsimile of Alchemilla mollis with small mounds of matt green leaves and short, slender stems that are topped off by clusters of tiny, green-yellow flowers.